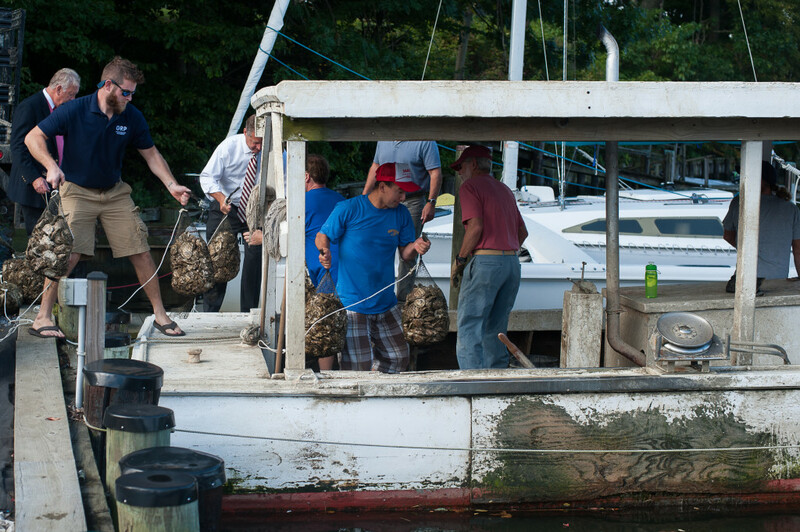 Join thousands of Maryland waterfront homeowners and community organizations growing oysters in a statewide effort to help restore the health and habitat of the Chesapeake Bay and its tributaries. Launched in September 2008, the Marylanders Grow Oysters (MGO) program raises awareness about the importance of oysters to the Bay’s ecosystem, and provides citizens a no-cost opportunity to make a tangible difference in the health of their waterways. The Marylanders Grow Oysters program currently serves 30 Maryland tributaries, each led by a local coordinator – a community association, RiverKeeper or similar group – who recruits participant waterfront property owners, organizes the delivery of the oyster cages, and develops a collection plan for the oysters after they have grown. In the fall, participants are given their cages of spat-on-shell to hang, tend and protect during their vulnerable first few months of life from smothering silt and predation. The oysters require minimal care – mostly rinsing the cages every week or two – ensuring they are able to receive the vital nutrients they need to survive, and preventing them from being exposed to freezing air, which is fatal to oysters. In the spring, the cages are collected and the oysters are planted onto a local sanctuary reefs where they continue to grow and flourish. If you are a waterfront property owner in Maryland and would like to get involved, please fill out the below form. To be considered for the program tributaries must have enough salinity to support oyster survival and growth. A tax-deductible donation to Marylanders Grow Oysters helps keep the program running at no cost to participant volunteers. REGISTRATION CLOSED: Thank you to all who submitted applications for this coming oyster growing season. Registration is now closed, but please feel free to complete the form below to be considered for next year’s Marylanders Grow Oysters program, which kicks off in fall 2019.